Laura Webber is the new Mayor of Port Charles on "General Hospital." HOLLYWOOD—A lot of story has been developing on “General Hospital” in the recent week. For starters Ned Quartermaine is no longer the Mayor of Port Charles, that honor has been bestowed to Laura Webber. 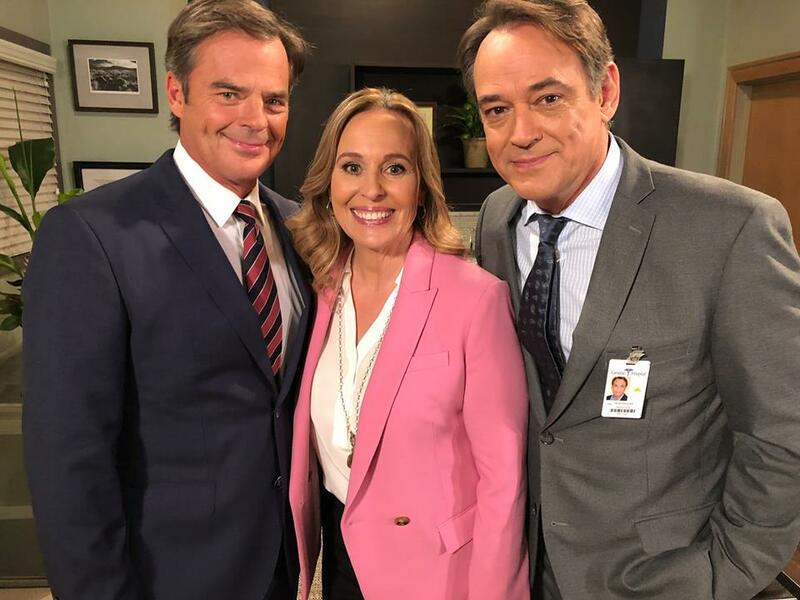 Yes, this is phenomenal news because Genie Francis has been front-and-center on the soap ever since she returned and I would make the argument things are only going to get better in the coming weeks. With Laura now such a power player in PC, Ryan should be worried about Laura and her mission to catch the elusive killer who has already killed three people and another attack is looming. More on that later because it’s very intriguing to say the least! With that said, I’m worried if Spencer’s little role in attempting to rig the election will come back to bite Laura in the bum? I suspect not because it seems like a mute issue at this point. Everyone and I mean almost everyone is happy with Laura’s victory, especially her daughter Lulu. Lulu as a reporter might be the best thing to transpire in years. The character has fervor and a purpose that she didn’t have as much in the past. She is hell bent on spilling on exposing any connection to the town’s current serial killer and her obsession with Kevin not being himself is placing her in danger. Little does she know the target on her back is growing and growing! Ryan has his sights on her, but dear ole’ Kevin’ has his sights on a lot of people. Carly and Franco have been circling the notion that Kevin, um I meant Ryan isn’t himself, especially after he severed ties with Franco who was livid. Ryan is making a major mistake putting all his info in his office, which not only is Franco aware of, but so is Carly. Carly is desperate to get the info on her mystery patient at Ferncliff and it has forced Kevin to place Carly on his kill list. Could Carly Spencer meet her maker? It’s possible, it would be a game changer for the soap if it happened, but I just don’t see it. On top of that, Ava has pondered leaving town with Kevin, but she wants Avery alongside. Sonny wasn’t having it and when Ava spilled those beans to Ryan, he added Sonny to his kill list. Ryan right now thinks he’s invincible and he’s been gloating to the police department how the killer is smarter than them and he’s getting sloppy. Promo video has teased Ryan’s latest attack or victim will be his boldest yet, which makes me wonder, WHO and HOW will they meet their maker. It looks like murder is headed to PC yet again, this time on the holiday of Martin Luther King Jr. In other news another hot story is cooking involving Sam and her past, this time with Kristina new mentor, Hank, wait I meant Shiloh. Jason first pegged the name, which immediately caught Sam’s interest as she realized that she conned his father out of a lot of money during her thieving days. Shiloh is acting like a saint, but Sam and Jason know something is off. Too bad Kristina, Daisy, Oscar and everyone else doesn’t. Hank claims to know Drew from his war days, but those memories have yet to come back to Drew who is too busy battling the realization that his son is knocking on Death’s door. Yes, Oscar is dying, but rather GH takes that route yet again is still up in the air America. Everyone seems aware of the situation at hand, but very little talk has been made of it. Julian is still pinning after Kim, just as Alexis seems lost in the wind. I am more intrigued with this Shiloh backstory because whatever his agenda is has to be wicked to the core, and with February sweeps slowly approaching I’m certain the audience will get more detail. Other news worth mentioning is Anna temporarily going blind, but not much has bene made of that story at the moment. I’m hoping this isn’t another reason to send the character off for a few weeks. I mean Finn and Anna are cute, but what else is going on there. We have Chase still attempting to get closer to Willow, who still has a torch for Michael, and it seems the audience is finally learning what has been bothering Aiden; he’s being teased about his sexuality in school. This brings me to the battle of all battle: Valentin is on very thin ice with Obrecht who was on the verge of spilling all Nina about Sasha not really being her daughter. I wanted Obrecht to blurt out the truth to Nina who is so caught up in her emotions she can’t see how vicious Valentin can be to get what he wants. Nina’s concerns have been raised, just as Peter who knows Liesl has something on Valentin. The walls are tightening slowly on Valentin, and with Obrecht well aware of Nelle’s secret, this woman can drop bombs anytime she wants and I cannot wait until she does so. “General Hospital” is heating things up and I’m eager to see how things plan out.